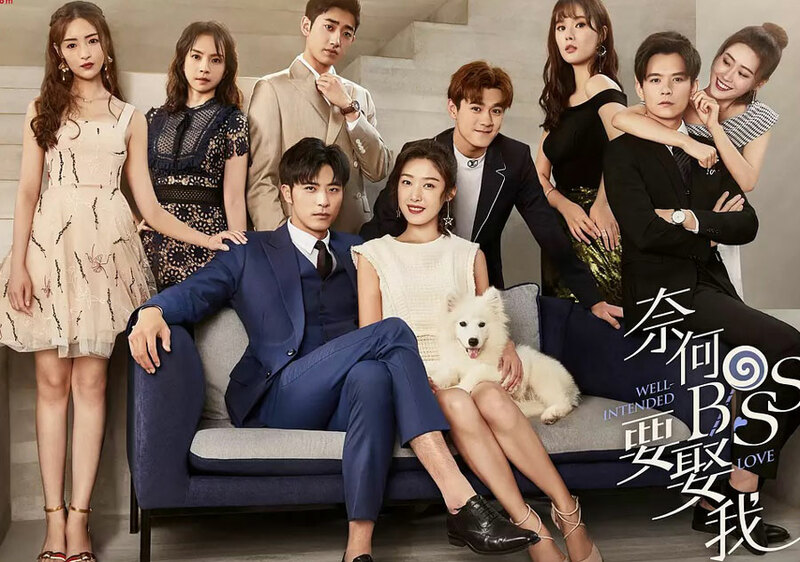 These are recaps of Well Intended Love Chinese Drama Episodes 17-18, Xia Lin mocks at Nan Jingtian that he fears to be abandoned so that he abandons everybody. He blames her that she abandoned him for Ling Yizhou, so he doesn’t need the friend like her. He smirks that he catches Ling Yizhou’s weakness when he has her. 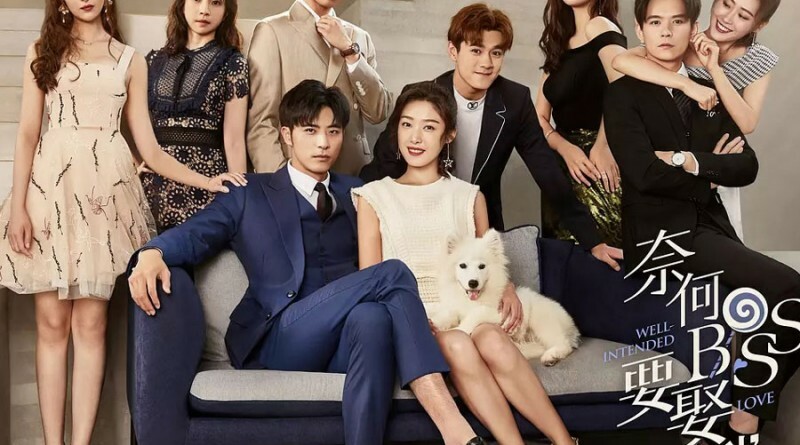 Note: From here on out there are specific plot spoilers for Well Intended Love Chinese Drama Episodes 17-18. Ling Yizhou is informed that Xia Lin is kidnapped, and goes to look for her. He spots her car but nobody is inside. Xia Lin wakes up and spots Tong Tong. She knows that Tong Tong is instigated by someone. Xia Lin remembers the earrings Ling Yizhou gave to her, and it’s installed GPS. She tries to move Tong Tong with their friendship, and asks for the earrings. Tong Tong feels guilty for kidnapping Xia Lin and conceals Nan Jingtian to give earrings to Xia Lin. When Xia Lin gets the earrings, Ling Yizhou finds her trace. But Nan Jingtian discovers the earrings. Nan Jingtian scolds Tong Tong and asks her to get rid of the earrings. Xia Lin pushes him over and finds out she is in his house. He laughs and thinks Ling Yizhou will regret if he knows he was close to her. He guesses the location is exposed, and decides to transfer Xia Lin. She doesn’t want to leave, and finds out he keeps the dog. She blames him for being cruel to her. But he rages that she doesn’t know what he suffered. It was Nan Jingtian’s mother’s death anniversary when Ling Yizhou’s mother ran away with Nan Jingtian’s father. So Nan Jingtian hates Ling Yizhou. Ling Yizhou cannot find Xia Lin, so he visits An Ran. But she refuses to reveal the man’s name. She tells her it’s a revenge to him, and thinks nobody will believe Xia Lin is innocent after she is missing. Ling Yizhou is sad and goes to bar buying drink. The waitress catches the chance to take the photo when he is drunk. Chu Yan sees the news and blames Ling Yizhou for flirting with another woman. Ling Yizhou claims that he is in pain and needs time to breathe. Chu Yan rages and wants to look for Xia Lin alone. Yin Shuangshuang runs into Ling Yizhou at the club, and takes him away. He stays in her house all night. Nan Jingtian tells the news to Xia Lin. But she doesn’t believe Ling Yizhou will betray her. Nan Jingtian rages to grab her neck. Jia Fei sees the news and misunderstands Ling Yizhou, and rages to throw the baby’s photo to him. Wen Li stops Jia Fei and confesses his love to her. He tells her that Ling Yizhou makes rumor to draw the murderer out. Ling Yizhou takes his baby’s photo to visit An Ran, and tells her that Xia Lin is pregnancy. An Ran hates Xia Lin but doesn’t want to hurt the baby. Ling Yizhou suspects Nan Jingtian, so he lies that Nan Jingtian gave the photo to him and makes An Ran tell the truth. Ling Yizhou confirms that Nan Jingtian is the kidnapper, and remembers he wanted to surprise him. He thinks Nan Jingtian doesn’t have reason to hurt him, so he asks his mother what she did to Nan Jingtian. Mother is stunned and reveals she made Nan Jingtian’s mother die when she stayed with his father. Ling Yizhou sighs that his mother’s love ruined him and Nan Jingtian, and will ruin Xia Lin. Ling Yizhou gets a message from police who finds Nan Jingtian’s location. His mother calls Nan Jingtian and persuades him to surrender. But he hates her and remembers his father kicked him out when he offended the lady. He cannot forgive her and declares to give her a big present. When Ling Yizhou and police arrive at the hotel Nan Jingtian stays, the room is empty. Xia Lin says that she wants to drink water. Tong Tong gets off the car to buy her water. But Xia Lin wants to go to the toilet. Nan Jingtian worries that Xia Lin tricks him and shows the gun to her. He warns her not to flee. Xia Lin claims she is pregnancy and won’t run away. Ling Yizhou and police arrive at the stop they stayed, and the tourist provides the valuable message. Xia Lin handed over the note to tourist so that Ling Yizhou found the stop. But he was late because Nan Jingtian transferred Xia Lin. He blames her for leaking their trace. She says that she only promised not to run away, but didn’t promise not to call police. Xia Lin realizes Nan Jingtian knew her move, but he didn’t stop her. He tells her that he is going to flee oversea. Xia Lin worries about it and decides to flee before he goes oversea to avoid him to hurt Lin Yizhou. Tong Tong gives the apple to Xia Lin. Xia Lin sees that Tong Tong loves Nan Jingtian, so she keeps helping him. Tong Tong tells Xia Lin that she didn’t lie to her about her background. Her father ran away because of debts, and Nan Jingtian paid it off for her. Xia Lin tells Tong Tong to go to school instead of fleeing with Nan Jingtian. But she knows that she won’t change her mind. Tong Tong tells Xia Lin to obey her because Nan Jingtian doesn’t really want to hurt Xia Lin. But Xia Lin locks Tong Tong up when she gets the water for her. She takes the phone on the table and wants to call police. But Nan Jingtian returns. He tells her that he will forgive her if she apologizes to him. But she thinks he is a coward. She says that she treated him like friend before. Xia Lin mocks at Nan Jingtian that he fears to be abandoned so that he abandons everybody. He blames her that she abandoned him for Ling Yizhou, so he doesn’t need the friend like her. He smirks that he catches Ling Yizhou’s weakness when he has her. He is intention to play cat and mouse game to everybody. Chu Yan thinks Nan Jingtian wants to take his mother’s revenge so that he kidnapped Xia Lin. His goal is to make Ling Yizhou’s mother in pain. Ling Yizhou feels guilty that Nan Jingtian’s revenge involves Xia Lin. Chu Yan comforts Ling Yizhou amd promises to find Xia Lin. Xia Lin refuses to eat and drink. Tong Tong worries about Xia Lin. Nan Jingtian tells Xia Lin that he sent the photo of his baby to Ling Yizhou, but feels regrets that he didn’t see his expression. He decides to visit him. Xia Lin agrees eating but asks for paper and pen. Nan Jingtian sees Xia Lin’s drawing, which is her dreamed home. Nan Jingtian takes away the drawing. Nan Jingtian meets with Ling Yizhou and lies that he didn’t kidnap his wife. But Ling Yizhou exposes it. Nan Jingtian thinks the scene is the one he expected, and gives the drawing to Ling Yizhou. Ling Yizhou gets the location when remembering the past with Xia Lin, and reports it to police. Nan Jingtian knew Xia Lin sending message to Ling Yizhou through the drawing, but he didn’t stop it. Because he wanted to play them. He blocks the police on the way, and asks Ling Yizhou to come to the place alone. Ling Yizhou sees that Nan Jingtian wants to torture Xia Lin and takes revenge for his mother. He tells him to do it to him. Nan Jingtian says that his mother ruined his life for love, so he wants to ruin Ling Yizhou’s life and makes his mother in pain all her life. Nan Jingtian decides to kill Xia Lin in front of Ling Yizhou. But Tong Tong pushes Nan Jingtian over. Nan Jingtian shoots Ling Yizhou, but he doesn’t want to give up and wants to kill Xia Lin. Just then police arrive. Tong Tong tells Nan Jingtian to flee.